Friday 10th May is our first day on site at RHS Chelsea 2013. We arrive to an almost empty Pavilion with the Monument in the centre. That’s our home for the next couple of weeks. Ricky and I have selected our trees for the show and the big ones arrive on that first day; when I say big, I mean big. The multi-stemmed Betula pendula are extremely tall, by the time those of you that are staging the exhibit arrive on site you’ll know if they fit or not! We are told that the BBC will be on site to film the arrival of the trees. I hope they look impressive and all goes according to plan. 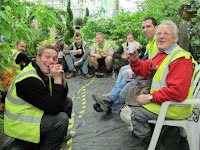 Next Tuesday – 14th May is our Staging Team Briefing, for those team members that can make it. I’ll tell you how things are going, what to expect and answer any of your questions before we arrive on site the following day, or on the Thursday. You’ll get your passes, high viz jackets, Showa gloves and details of where we are staying just off the Gloucester Road in the apartments we’ve used for the past few years. We’ll load up the minibus with essential supplies, such as the beer and wine for the bar in my room for pre-dinner drinks, and Sue’s tool kit ready for the following day. 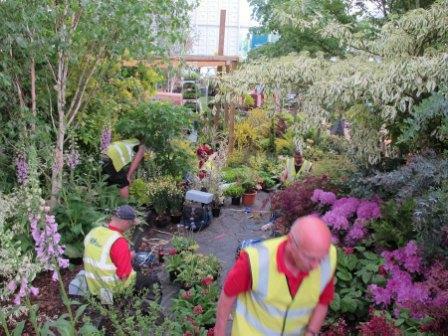 The following morning Chris Wilde from Banbury garden centre (it’s his first year as part of the staging team) will meet those of us travelling from Hampshire at Ampfield house at 5.45 a.m. ready to head off for London. We want to be on site at 8 a.m. if possible ready to meet the first lorry delivering our plants. On site we’ll meet Nigel and Neil, Steve and Luke will have finished by then and will have headed back to Hampshire. We’ll also meet Jamie from Wakefield, Gillian from the Chelsea Physic Garden and Owen from London who are joining the team in London. 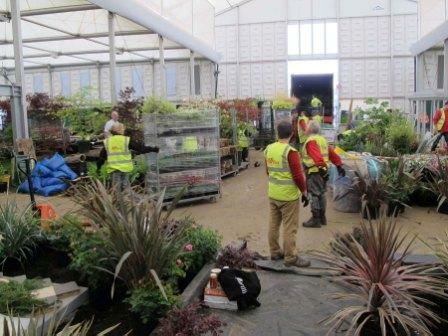 The first day is all about unloading the first three lorries of plants, watering, untying and preening the plants. We also want to get as many of the larger plants into position as possible. To make space for another three lorries of plants and more of the staging team the following day. No, that’s not it. There will still be three lorries of plants on Friday and two on Saturday. There is catering on site and we’ll use this for lunch and breaks on the Wednesday, but we will have a tea station up and running on the exhibit on the Thursday. On the first day we’ll work ‘til around 6 and then head to the apartments to check in: showers, drinks and then out to eat. 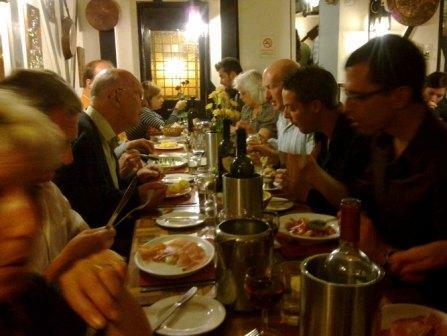 Nigel and Neil will have booked somewhere for us to eat that evening. We do something similar each evening – meet for drinks in my room and then we book a restaurant for everyone; nothing smart but good food and good fun. Our daily regime is meet at 7a.m. – head off to the café. Not saying which one on here; we don’t want too many others to join us! Arrive at the show at 8a.m. Break for lunch around 12.30 - work until 6 or later if necessary. During the first day you will find there is a bit of standing around for some of you until we really get into the staging routine. From Thursday we start to split up into smaller staging teams working on specific areas of the exhibit. I’ll give you a brief. Tell you what I’m looking for in terms of a colour theme and then I’ll help to get you started. You’ll find your creativity develops as we go along and we all get inspired by the plants. However it’s not all about painting with plants there’s lots of heavier prep work to do: cleaning up, closing up the plants as they thin out, breaking down Danish trollies, lugging bales of bark. Believe me, no job is more important on the exhibit than any other – all tasks are part of the creation of the Hillier exhibit; never think that a menial task is unimportant!